While all of LGI Homes communities are in areas notorious for remaining temperate year-round, there’s something about springtime that seems to inspire people to step outside and spend time in the sunshine. 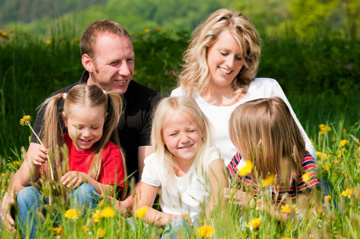 From fun family picnics at the park to relaxing afternoons amongst nature on a walking trail, residents of our communities have access to countless outdoor activities in the comfort of their own neighborhoods. If you’re curious about the outdoor fun you could be having just moments from your front door, check out these outdoor activities present in many of LGI Homes communities. One of the comforts of buying an LGI home is that each of the builder’s communities offers an array of amenities for residents. Parks – Opportunities for fun are endless at your local park, and almost all of our neighborhoods have at least one park present in the community. Change up your reading routine and spend a quiet afternoons alone with your favorite book at the park, or pack up the kids and spend the day bug catching or playing make believe. Our parks are the perfect place to teach your little ones how to play catch or treat your dog to a quick game of frisby. Walking Trails – Looking for an easy way to shed a few pounds for summer? Take advantage of the walking trails incorporated into some of our communities. Not only will you notice your waistline slimming down after a few weeks of short afternoon walks, you’ll also notice an improvement in your overall health and happiness. Take a walk by yourself, with your partner, with the kids or with your four-legged friend this season. Fields – Some of our communities are home to multi-purpose fields that are great for a game of soccer, football, rugby or any other sport that strikes your fancy. This summer, you can expect to see the kids gathered together tossing a ball back and forth or playing tag, or you could take advantage of the season and engage in a little bit of friendly competition by forming sports teams with your neighbors and hosting weekly games for the whole neighborhood to partake in. Greenbelts – Are you a wildlife lover or a birdwatcher? You don’t have to head off to the wilderness to experience nature as a member of an LGI Homes community, as several of our neighborhoods feature open greenbelt areas that are home to a wide variety of native wildlife. 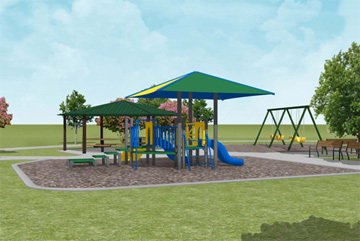 Playgrounds – With summer break approaching and the kids out of school, you’ll likely find your children have tons of energy and no outlet for any of it without the daily routine of recess. Let the kids run wild and spend time with their friends at your local playground. Pools – As the weather continues to heat up and the summer sun becomes unbearable, residents in our communities with pools will most certainly take advantage of the opportunities to get wet and stay cool. Some of our communities even feature splash pools for toddlers, so even our youngest residents can enjoy the fun! It’s hardly a secret that owning your own home is cheaper and an overall better investment than renting, but many people find themselves postponing purchasing their first home due to their own fears and worries about this exciting new chapter in their lives. While home ownership is certainly a huge responsibility that shouldn’t be taken lightly, the truth is, most people put off purchasing and remain in the vicious cycle of renting for far longer than they should because they aren’t capable of telling that they’re ready to buy a home of their own. If you’ve been on the fence about whether or not now is the perfect time to dive into home ownership, check for these signs that you’re ready to become a homeowner. If you’re a first-time homebuyer unsure whether or not you’re financially ready to buy, read over these tips. 1. You’ve Mastered the Art of Budgeting – When you first moved out on your own and started renting, chances are, many of your dinners consisted of Ramen noodles and you found yourself struggling to pay the rent every month. As you matured and adjusted to the responsibilities of adulthood, you probably got better at managing your finances and paying your bills began to feel as natural as brushing your teeth. If budgeting is now second nature to you and you’re no longer in a place where you’re living paycheck-to-paycheck, you’re probably ready to convert that rent check into a monthly mortgage payment. 2. You Have a Steady Source of Income – Homeowners come from all walks of life, from waitresses to neurosurgeons. You don’t have to be pulling in a six figure salary to own your own home, and simply having a steady source of income that you can rely on is a good sign that you’re ready for the commitment of owning your own place. If you’ve had your current job for at least a year and can realistically see yourself staying there for at least another five years, home ownership might be in the cards for you. 3. Your Debt is in Control – Plenty of current homeowners have had their fair share of financial hard times, but most walk into home ownership with their debt in check. If your making your monthly payments in time and in full, you don’t have any outstanding judgments or levies against you and you have more credit available to you than you have maxed out, you’ll have an easier time obtaining a mortgage and will have to put a lot less work into purchasing a home. 4. You’ve Got Money in the Bank – Buying a home usually requires some form of down payment, and if you’ve got a substantial amount of money in savings it will make the home buying process a breeze. Having money in the bank is also important for affording the unforeseeable situations that arise from time to time when you own your own place, such as maintenance and repairs. 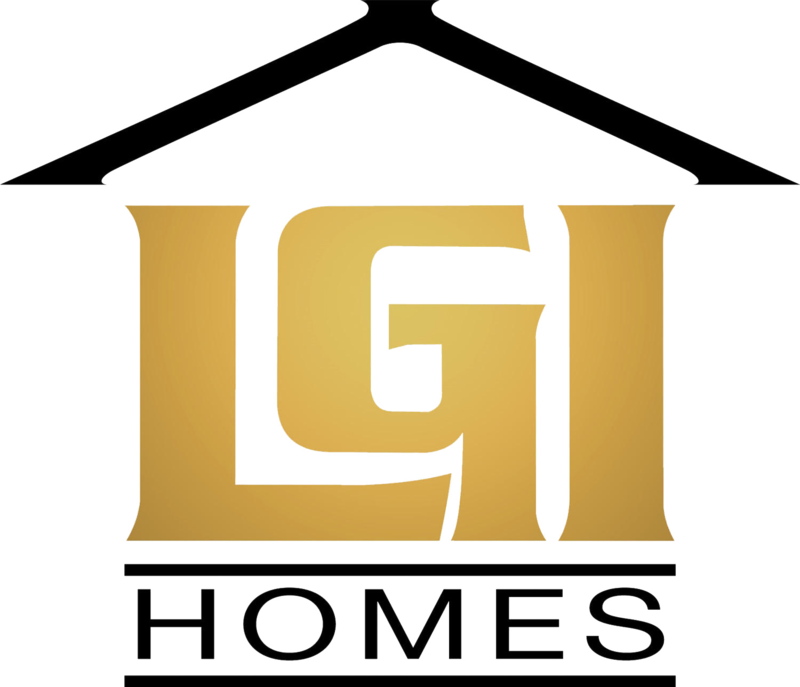 It is important to note, however, that LGI Homes offers a no money down option to buyers, so just because you don’t see this sign in yourself does not automatically mean you are not ready. 5. You’re Ready to Settle Down – This doesn’t necessarily mean you’re ready to get married and start a family (though it certainly could), it simply means you’re ready to have a place you’re comfortable with calling home for the foreseeable future. Most renters move every time their lease is up, which can be fun and exciting during certain phases of adulthood. However, if you’re itching for a bit of stability and a place that is all yours for years to come, now is likely the perfect time to look into buying a home. From scheduling tours to browsing neighborhoods and shopping lenders, you’re likely so caught up in the excitement of buying your first home that identity theft is one of the last things on your mind. While many people tend to live with the mindset that identity theft will never happen to them, more and more people fall victim to the crime every year. As you prepare to take out a mortgage and purchase your first home, use these tips to help you avoid falling victim to identity thieves and scams. Identity theft can have detrimental effects on someone trying to obtain a mortgage, so be sure to protect your ID the best you can. 1. Check Your Credit Report – 35% of your credit score is your payment history, so keep a close watch on your’s to make sure the information is correct. Contrary to urban myth, pulling and reviewing your own credit report does not hurt your credit score, and as you prepare to purchase a home, you should be checking up on your report each and every month. Scour through the entries with a fine-tooth comb to make sure each and every account listed on the report was in fact opened by you. If you find any accounts that were opened without your knowledge, dispute them immediately through the reporting agency and file a police report. 2. Shred Your Mail – During the home buying process, you might receive countless letters from lenders advertising guaranteed financing. Some of these letters may even include vouchers and cards that a thief could attempt to cash in for themselves using your information. Buy an electronic shredder to shred any offers you don’t take up. 3. Protect Your Social Security Number – When shopping lenders by phone or in person, don’t give out your social security number unless the person you’re speaking with has an absolutely imperative reason to know it. You would be shocked to learn just how much an identity thief can do with something as simple as a string of numbers, but from opening credit cards to purchasing houses, a social security number can take an identity thief a long way on your dollar. 4. 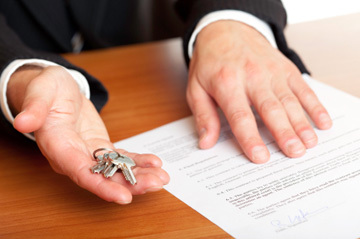 Check the Background on Lenders – Don’t take a lender’s word for it when they say they are licensed. Many unlicensed lenders have set up scam shops and have led borrowers into extreme amounts of debt. Do your research and make sure a lender is licensed in your state to ensure it is a legitimate business and not a front for an identity theft ring. 5. Place a Fraud Alert on Your Credit Report – Attaching a fraud alert to your credit report will force lenders to ask for a backup form of identification anytime you – or anyone else – attempts to obtain a line of credit in your name. This will catch potential thieves red handed while they’re in the act of trying to steal your identity, and will give you piece of mind throughout your home buying experience and beyond. The purchase of a new home requires learning all about various aspects of homeownership (financial, legal, and practical) that can be overwhelming to a first-time homebuyer and homeowner. As part of our ongoing All About series, LGI Homes seeks to provide an easy-to-read and easy-to-understand resource that goes in-depth on a variety of subjects connected to buying a home. Today, we explore the world of credit scores and how they will play into your experience of buying and owning a home. If you’re unsure about how your credit score effects your ability to buy a home, be sure to read over these frequently asked questions. 1. What credit score do I need to get a home loan? – Typically speaking, most lenders prefer applicants who have at least a 620 credit score. A score lower than 620 is considered sub-prime, and it will be difficult to obtain a loan. A score between 620 and 650 is considered fair credit, anything higher than 650 is considered good credit and obtaining a home loan should be relatively easy – provided you have no other warning flags in your credit report, such as bankruptcy. 2. Can my credit prevent me from getting a loan? – Essentially, yes. If you have a credit score less than 620, some lenders will deny your application outright. However, some may be more than happy to work with you. If you’re unsure about your credit score, give LGI Homes a call. 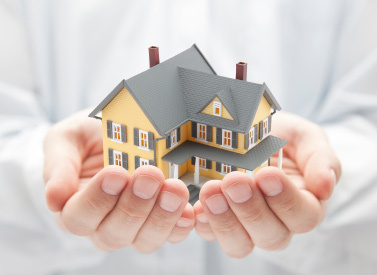 We may be able to assist you in obtaining the home of your dreams. 3. Will my credit score influence my payment amount or interest rate? – It might. Your payment amount will largely depend on how much you borrow and the terms of your loan, and your interest rate will mostly be determined by current market conditions. However, most lenders have a base interest rate for average credit and a sliding scale for people with higher or lower than average credit. For example, borrowers with a 760 credit score or higher may qualify for a 3.818% interest rate, while borrowers with the bare minimum score of 620 credit might be looking at a higher rate. Your interest rate will impact how much total you have to pay on your mortgage, so the better your credit, the less you’ll have to pay in total. 4. How can I raise my score? – If buying a home is on your current priority list, it certainly won’t hurt to start trying to raise up your credit score before you go house hunting and lender shopping. The easiest way to raise your score is to make all of your payments on time and in full every month. Doing this for even just a few months will help bring up your score. Pay down any existing debts you have as much as you can. 5. How can I buy a home with bad credit? – If your credit score is bad, you may be able to obtain a home loan provided you can put down a pretty sizeable down payment. You may also be able to find a lender who specializes in lending to people with poor credit, but expect your interest rates to be higher. After your mortgage has been secured, the closing costs have been paid and your boxes are unpacked and settled into your first home, it’s time for you to sit back, relax and enjoy the many benefits that home ownership provides. It’s no secret that owning a home is one of the best tax breaks handed out by the federal government. A variety of tax breaks are given out to home owners, but no such breaks exist for those who choose to rent. If you’ve recently taken the plunge and purchased your first home, use this helpful guide to learn about how your tax filing process will be different – and learn how much money you can expect to save. If you’re a first-time homebuyer, be sure to familiarize yourself with your the 3 major tax deductions you’re eligible to claim. Schedule A – Renters don’t have the ability to claim any deductions on their taxes, but as a homeowner, you have several deductions you get to claim. The three biggest home related deductions are your mortgage interest, any points connected to your home loan and your property taxes. You’ll itemize these deductions when you file your long form 1040 and detail the deductible expenses on Schedule A. Doing this on your own the first time can be confusing, so you may want to hire a professional to walk you through it your first tax season as a home owner. Your Mortgage Interest Write-Off – Out of your three major deductions, your mortgage interest will more than likely be the largest one. During the first few years of owning your home, most of your mortgage payments will go straight to interest, so your highest deductions will be during this few years. Make sure you fully account for all money that was paid toward interest on your mortgage to make sure you get the maximum deduction. Pay Attention to Your Points – Your 1098 should list any points you paid for your mortgage. A point translates to 1% of your loan amount. Many home owners choose to pay points to obtain a lower interest rate on their mortgage. The IRS lets you deduct points for the tax year that you purchase the home. You include the points paid in the same section of Schedule A where you claim your mortgage interest. Property Tax Deductions – The third major home-related tax deduction is your real estate taxes. Real estate tax deductions are dependent on when you bought your home and your jurisdiction’s tax year. The tax year typically runs from January to December. Problems arise if your buy your house in July and taxes are due in March, because the seller prepaid the taxes on the home for the full year when they filed in March. Other Deductions – In some cases, you might be able to write off other expenses related to owning your home. For example, if you moved because of your job, you may be able to write off relocation expenses. If you’re self-employed, you can write off a portion of your mortgage and associated bills as business expenses. Home renovations that are done because of medical issues or disabilities, such as building a wheel-chair ramp, may also be deductible. What Isn’t Deductible? – When filing taxes for the first time as a home owner, try not to get too carried away with the deductions. Not everything related to owning a home is deductible. For example, non real estate taxes aren’t deductible, private mortgage insurance is not deductible, furnishing and décor are not deductible and your regular bills are not deductible. Spring is the perfect time of year to get your garden in order by planting vibrant flowers, bushes, and trees, plus juicy vegetables and sweet fruits. As the weather begins to warm up and the plants begin to bloom, you’re probably itching to get your garden back up and running after a long winter of neglect. From fallen branches to dead perennials and dried out grass, your garden is probably in need of quite a bit of TLC. To speed things up and ensure you have a lush, healthy garden worthy of showing off to the neighborhood, follow these helpful tips. Before you get to work choosing new flowers and bushes to plant, spend some time getting your entire yard and garden areas in order. Pick up and fallen branches or debris, cut down last year’s perennials, rake out mulch from your flower beds and check the status of any trees you might have. If you notice any branches that are snapped or weak looking, hire an arborist to deal with the tree for you. If you have bird baths and other decorative items, scrub them out and clean them thoroughly. Not only will birds and other creatures enjoy using them more, but they will be more pleasant to look at for you and your neighbors. After a full season of being kept on a shelf or in the shed, you may find some of your hand tools have developed rust and some of your motorized tools are in need of maintenance. Check each of your gardening tools to make sure they are in proper order and replace or repair tools as needed. Purchase an at-home pH testing kit to test the pH levels around your yard. Test the soil anywhere you plan on planting flowers, vegetables or other foliage. If the pH level is too high, you can fix it by mixing some elemental sulfur into the soil. If the pH level is too low, simply mix in some dolomitic lime to raise it. Plants that have dry or damaged branches won’t bloom as full as plants that are entirely healthy. Prune all of the bushes and other plants in your garden area to remove any diseased or damaged areas so they can grow their fullest this spring. Spend a day weeding all of your plant beds and removing any other debris, such as dead leaves. You can use the leaves to create a compost pile if you desire. Beds that are free of weeds and other obstructions will provide healthier and more vibrant flowers and other plants. Some plants flourish best when planted early in the season, such as bare-root trees, shrubs and perennials. 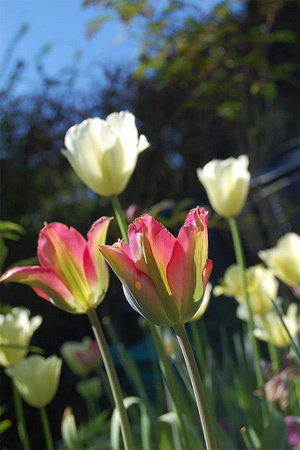 Others are better suited for the end of spring, such as container-grown plants. Fertilizing can be the difference between petite pumpkins and gourds that set records for height and weight. Fertilized plants also tend to be more vibrant and overall healthy than plants that are left to grow in regular soil alone. Use a balanced fertilizer appropriate for the type of plants you’re growing. If you’re a first-time homebuyer with minor credit issues, take a moment to try these steps for boosting your score prior to applying for a mortgage loan. So you’re ready to take the plunge into home ownership and you’re itching to get out and start exploring in search of the home of your dreams. But what happens when your credit score isn’t quite as ready for buying a home as your mind is? Poor credit could easily make finding a mortgage lender difficult, or could result in higher interest rates and all-around worse deals than a good credit score would provide. If you’re planning on buying your first home in the near future, follow these tips to help raise your credit score and build a well-rounded credit history that will make lenders want to loan you the money for your mortgage. Some studies have estimated that as many as 25% of all credit reports contain inaccurate information. Even the smallest error could be the difference between getting a mortgage at a great rate or no mortgage at all. Once you’ve decided to buy a home, pull your full credit report and go over it thoroughly to make sure all of the information listed is correct. If you find errors, dispute them through the credit bureau that reported it. The best and easiest way to build up your credit score is to pay all of your bills on time and in full every month. Paying them early looks even better. With each payment you make, your score will grow and your overall debt will shrink. If you’ve had any past overdue accounts go into collections or have had a lender obtain a lien or judgment against you, you’ll want to have them all paid off entirely before you start looking for a mortgage lender. While lenders will still be able to see that you had judgments, collections and liens against you for up to seven years, having these paid off looks better than having them outstanding on your credit report. While your credit card might have a $10,000 maximum balance, having it maxed out looks bad to potential lenders and doesn’t look good on your credit history. Some lenders may consider multiple maxed out balances to be a sign of irresponsibility on your part. Try to keep all of your balances at 30% of the maximum. If that’s not possible, aim for less than 50%. Even if you haven’t used that department store credit card and years and you finished paying it off ages ago, don’t go rushing to close the account. All accounts on your credit report can be beneficial toward your score, even those with a zero balance. Let all of your accounts continue to accumulate even after you’ve paid them off. The longer you’ve had the account in good standing, the more it will help. Having several credit cards is a great way to start building credit, but it’s not good at demonstrating that you can be responsible for managing multiple forms of credit. The more diverse your credit, the better. Credit cards, auto payments, student loans and other forms of loans that are all in good standing on your report shows you know how to use multiple types of credit and can handle multiple responsibilities at once. Whether you’ve recently moved into the home of your dreams or you’re long settled in but looking to give your space a makeover, the Internet is a priceless resource when it comes to home decorating ideas. With these online resources, you’ll find countless tips, tricks and looks to get your creative juices flowing and inspire you to revamp any room in your home. Pinterest is one of the best online resources for finding pictures of different types and styles of home decor. Best described as a virtual bulletin board, Pinterest is a fast growing site that allows users to search for ideas from around the internet and “pin” them into easily organizable folders. 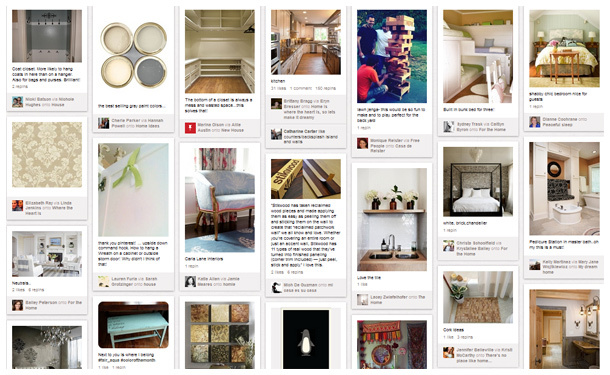 You can easily search through Pinterest to find ideas pinned by other users. Pinterest is particularly well known for home decorating ideas pinned by users, and is probably one of the best online resources you will find. It’s great for discovering hot trends and color schemes, as well as do-it-yourself décor projects and vintage inspiration. Not only will you find excellent permanent decorating ideas on Pinterest, you will also find unique party and event decorations to spruce up your home for birthday parties, holidays and neighborhood get-togethers. Real Simple is an online lifestyle magazine that has tons of useful home décor articles – and new ones are added daily. Whether you’re looking for the perfect color for your dining room accent wall or inexpensive ways to organize your laundry room, you’ll find dozens of ideas to jump start your imagination and inspire you to give your home a makeover. Real Simple is also great for finding links to online décor shops, where you can often purchase unique decorative items for cheaper than you can usually find in stores. There are literally thousands of home décor blogs floating around the Internet, all run by everyday Joes and Janes just like you. Blogs offer a unique experience over online magazines and websites, because they include a more personal element and frequently feature peaks into peoples’ lives. Blogs can be excellent for finding ideas, because you can find a writer who shares similar taste in décor to you rather easily. Some well-known décor blogs include The Inspired Room, House of Smiths, Young House Love, and The Lettered Cottage. Houzz is an up-and-coming website that allows you to build a virtual idea book for every room in your house. You can browse other peoples’ idea books by room, read helpful articles relevant to home decorating and remodeling, find professionals and connect with other décor enthusiasts through the site’s message boards. Just like their traditional magazine, Better Homes and Gardens’ website is stocked full of fabulous and fun ideas that will transform your home. Typically, the articles and ideas on the website are completely different from the ones featured in the magazine, and unlike the magazine – which is issued monthly – the Better Homes and Gardens website is updated daily. In addition to decorating ideas, you’ll also find excellent recipes, entertaining tips and other lifestyle advice. It’s quite possible that Martha Stewart is the best known home decorator in the history of home decorating, and her empire has expanded to the Internet with her Martha Stewart website. Much like the Better Homes and Gardens site, you’ll find thousands of decorating ideas for any occasion, as well as other helpful lifestyle articles. If you’re a homeowner, you’re eligible to have equity in your home, but first you must pay down the principle owed on you mortgage or allow your property value to increase. The purchase of a new home requires learning all about various aspects of homeownership (financial, legal, and practical) that can be overwhelming to a first-time homebuyer and homeowner. As part of our ongoing All About series, LGI Homes seeks to provide an easy-to-read and easy-to-understand resource that goes in-depth on a variety of subjects connected to buying a home. Today, we explore the world of property equity and how it will play into your experience of buying and owning a home. Equity is best described as being the financial interest or cash value of your house, minus the current balance on your home loan. Anyone who owns their home builds equity. Equity is not built by those who rent. Simply by paying your mortgage on time and in full every month! Each month that you pay your mortgage, that payment goes toward your equity. The closer you get to paying off your mortgage, the more equity you have. How does equity benefit me if I move? Equity is most beneficial when you decide to sell your house. At this time, the current value of your home is weighed against how much equity you have in the home and how much money you still owe on the house to calculate how much profit you stand to make. The more equity, the more profit. For example, imagine you purchased your home for $100,000, you have $25,000 in equity and the current value of your home is $200,000. You’ll sell the home for $200,000, use part of the sale to pay off the remaining $75,000 on your mortgage and walk away with $125,000 in profit from the sale. How does equity benefit me if I don’t sell my house? If selling your house isn’t in the cards for you, equity can still be beneficial. Banks will let you borrow against your equity to take out a secondary loan to use as you wish. So, if you have $25,000 in equity and want to use that $25,000 to pay for your child’s college tuition, you can borrow it from the bank, but your equity will return to $0. You will begin building equity again each month you pay your mortgage. While this doesn’t necessarily save you any money, it is easier than taking out a separate loan and is an option if you know you plan on staying put in your current house long-term. Spring time is a great opportunity to gather your neighbors and do a bit of cleaning up and organizing around your community. Spring is fast approaching, and with its arrival each year, countless people find themselves itching to throw out the old and bring in some new. Spring cleaning is an annual tradition across the world, and is a great time to clear out the clutter inside your home and show your lawn a little extra TLC after a long winter of neglect. Since virtually all things are more fun when you do them in groups, why not consider gathering your neighbors together to partake in a little bit of spring cleaning as a community? These tips will give you ideas for different ways you and your neighbors can clean out your homes, clear your yards and spruce up your neighborhood this season. If you’re looking to get rid of various odds and ends in your home but are also in need of some new things, call up your neighbors and see if they’re interested in hosting a community swap meet. Decide whose yard or driveway to use and pick a date for the swap to take place. Hand out fliers for a few weeks leading up to the event and invite everyone to bring any items they feel like getting rid of – so long as they’re in good shape, that is. Instead of charging money as you would at a garage sale, make it more about trading items. Let everyone who brings items what they wish from items others have brought. At the end of the swap, you can always donate leftover items to a charity shop, which leads us to our next tip. Many thrift stores work directly with various charities and donate a portion of their proceeds to a good cause. If you’re looking to get rid of old items or you have leftovers from a swap meet, consider donating them to your local charity shop. To host a community donation, enlist a few neighbors with trucks to assist everyone else to donate their unwanted wares. Have everyone bring their donations at a designated time and place, and then have all who are donating help load the trucks with their drop-offs. The trucks can then run the donations to the charity shop of your choice. Spring cleaning isn’t just about the way the inside of your house looks, it’s also about the condition of the roads, sidewalks and parks around your community. If you’ve noticed trash laying around your neighborhood throughout the winter, spring is the perfect time to pick it up. Gather a few neighbors together to patrol the neighborhood and pick up any garbage you find. Spring often goes by in a flash, and before you know it, the kids are on summer vacation from school. To help teens in your neighborhood out with a little bit of extra spending cash for the season, rally your neighbors together to put the teens to work. From mowing lawns that are quickly overgrowing to clearing out gutters and pulling weeds, you’ll find no shortage of lawn work that the teens can complete as part of your spring cleaning endeavor. They’ll enjoy having extra money to spend on days with friends, and you’ll enjoy having more time to relax without having to worry about giving your lawn a post-winter extreme makeover.